Andrew Patrick Wood (January 8, 1966 – March 19, 1990) was an American musician best known as the lead singer for alternative rock bands Malfunkshun and Mother Love Bone. Wood was also known for his flamboyance. Wood formed Malfunkshun in 1980 with his brother Kevin and Regan Hagar. The band used alter ego personas onstage, with Wood using the name Landrew the Love Child. Though the band only had two songs released, "With Yo' Heart (Not Yo' Hands)" and "Stars-n-You", on the Deep Six compilation album, they are often cited as being among the "founding fathers" of the Seattle's grunge movement. During his time in Malfunkshun, Wood started relying heavily on drugs, entering rehab in 1985. By 1988, Malfunkshun had disbanded and Wood began jamming with Green River members Stone Gossard and Jeff Ament. They soon began writing original material and formed Mother Love Bone the same year, adding guitarist Bruce Fairweather (also a former member of Green River) and drummer Greg Gilmore to the lineup. The following year, the band signed a deal with PolyGram, issuing a six-song EP, Shine, before going on to tour, supporting The Dogs D'Amour. Towards the end of the year, the band recorded their debut album, Apple, which was scheduled for release in 1990. Due to his struggle with drug addiction, Wood checked himself into rehab in 1989, hoping to get clean for the release of Mother Love Bone's debut album. On March 16, 1990, Wood was found in a comatose state by his girlfriend, Xana La Fuente, having overdosed on heroin. Wood was taken to the hospital and placed on life support. Wood died three days later. Landrew the Love Child, "Man Of Golden Words"
Wood was born in Columbus, Mississippi to David C. Wood and Marin A. Dahlberg, and raised on Bainbridge Island, Washington. He was the youngest of three children; he had two older brothers, Kevin and Brian. Wood and his brothers were exposed to various types of music by their parents, who also supported their children when they were learning how to play instruments. Wood became a fan of acts such as Elton John, Queen, Aerosmith, and Kiss. In 1980, at the age of 14, Wood formed Malfunkshun with his brother Kevin, recording their first demo tape in April 1980. Drummer Regan Hagar joined soon after with the band, playing shows in Seattle, Washington. Each member adopted onstage alter egos, with Andrew becoming Landrew the Love Child, Kevin becoming Kevinstein, and Hagar becoming Thundarr. Unlike most grunge groups in Seattle, Malfunkshun were influenced by glam rock with Wood described as "a hippie, glammed-out rock & roll god, equal parts Marc Bolan and Jim Morrison," with his look and vocal style influenced by frontmen such as Freddie Mercury, Paul Stanley, and Marc Bolan. By 1985, Wood had started to rely heavily on drugs to help with his "rock star" persona, and entered rehab the same year. Malfunkshun recorded a number of demos in 1986, two of which, "With Yo' Heart (Not Yo' Hands)" and "Stars-n-You", were included on the "legendary" Deep Six compilation album released by C/Z Records the same year. The band continued to play shows in Seattle, opening for Soundgarden, The U-Men, and Skin Yard. However, in 1988, Malfunkshun disbanded. Although the band never released an album and were also turned down by Sub Pop for "not [being] grunge enough," Malfunkshun, along with Green River, are often cited as "founding fathers" of the Seattle's grunge movement. Wood and Hagar began playing with Stone Gossard and Jeff Ament of Green River, which disbanded in 1988, performing, on occasion, as the cover band Lords of the Wasteland. Former Green River guitarist Bruce Fairweather was added to the lineup, while former 10 Minute Warning and Skin Yard drummer Greg Gilmore replaced Hagar, forming Mother Love Bone the same year. The band soon signed a deal with PolyGram, and, through their own subsidiary label Stardog, issued a six-song EP, Shine, in 1989. John Book, of Allmusic, stated that the EP "contributed to the buzz about the Seattle music scene." The band spent the rest of the year touring, including shows supporting The Dogs D'Amour, and recording their debut album. With high expectations of the album, Wood checked himself into rehab due to his struggle with heroin addiction, hoping to get clean for the release of album, staying there for the remainder of the year. In 1990, the band continued to play shows in Seattle, waiting for the release of their album, Apple. On March 16, 1990, Wood was found in a comatose state by his girlfriend, having overdosed on heroin. Wood was taken to Harborview Hospital and placed on life support. Despite being responsive, Wood had suffered a hemorrhage aneurysm, losing all brain function. On March 19 physicians suggested that Wood be removed from life support, and he was pronounced dead at 3:15PM that day. The official cause of death recorded on Wood's death certificate is hypoxic encephalopathy. Wood's remains were cremated. His burial site is located at Miller-Woodlawn Memorial Park in Bremerton, Washington. Apple was released posthumously later in the year, receiving positive reviews. David Browne of The New York Times wrote that "Apple may be one of the first great hard-rock records of the 90s" and that "Andrew Wood could have been the first of the big-league Seattle rock stars." Shortly following Wood's death, former roommate Chris Cornell of Soundgarden wrote two songs, "Reach Down" and "Say Hello 2 Heaven", in tribute to his late friend. Cornell then approached Gossard and Ament about releasing the songs as singles before collaborating on an album. Adding drummer Matt Cameron, future Pearl Jam lead guitarist Mike McCready, and future Pearl Jam lead singer Eddie Vedder, they formed Temple of the Dog in 1990 to pay tribute to Wood, releasing one self-titled album in 1991. I was thinking a lot about Andrew Wood at the time. We always had a great time when we did hang out, much like Chris Cornell and I do. There was never really a serious moment or conversation, it was all fun. Andy was a hilarious guy, full of life and it was really sad to lose him. But I always hate people who judge the decisions others make. So it was also directed towards people who pass judgments. 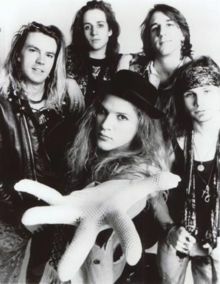 In 1992, PolyGram reissued both Shine and Apple as the compilation album Mother Love Bone, while the song "Chloe Dancer/Crown of Thorns" was included on the soundtrack to the film Singles. The same year, Los Angeles band Faster Pussycat wrote the song "Mr. Lovedog", from the album Whipped!, in tribute to Wood. Bradley Torreano of Allmusic stated that the song "offered a sad elegy to another charismatic figure in the metal world." Seattle rockers War Babies, which briefly featured Mother Love Bone's Jeff Ament on bass, dedicated the song "Blue Tomorrow" off their eponymous 1992 debut album to Wood. In 1993, Seattle post-grunge band Candlebox released their self-titled debut featuring the single "Far Behind," which was written in Wood’s memory. Wood's former band mate Stone Gossard compiled Malfunkshun recordings from 1986-87 and released the studio album Return to Olympus through his Loosegroove Records label in 1995. In 2005, director Scot Barbour completed production on the documentary Malfunkshun: The Andrew Wood Story. The film documents Wood's music career as well as his family background. The film premiered at the Seattle International Film Festival. In October of the same year, the film was screened at the FAIF Film Festival in Hollywood, California. The film was released in 2011 on DVD as part of a 2CD+DVD set entitled "Malfunkshun: The Andrew Wood Story" including the Return to Olympus album, a bonus CD including many interviews and demos, and the movie on the DVD disc. In 2011, the album Melodies & Dreams was released. It featured unreleased songs and demos that Wood recorded throughout his life, including a song that he recorded with Chris Cornell, "Island of Summer", which is the only existing recording from the two of them singing together. Wood is featured in the 2011 documentary Pearl Jam Twenty, about the story of Pearl Jam. Friends including Chris Cornell, Jeff Ament and Stone Gossard talk about him in the film and home-made footage featuring Wood is shown. On July 7, 2015 at a NYC show Slipknot and Stone Sour front man Corey Taylor performed "Chloe Dancer." ^ a b c d e f Prato, Greg. "Andrew Wood Biography". Allmusic. Retrieved November 13, 2010. ^ a b c d e f g h i "Kevin Wood: Malfunkshun, Devilhead, Fireants, Hippie Glitz guitarist and brother to the late, great Andrew Wood". Full in Bloom Music. Retrieved November 13, 2010. ^ a b c d e f g h Tinelli, Paul. "Malfunkshun Biography". Allmusic. Retrieved November 13, 2010. ^ a b c d e f Prato, Greg. "Mother Love Bone Biography". Allmusic. Retrieved November 13, 2010. ^ a b Ramirez, Marc (April 26, 1992). "Bliss Out -- The Scene's A Moving Target". The Seattle Times. Retrieved November 13, 2010. ^ Huey, Steve. "Skin Yard Biography". Allmusic. Retrieved November 13, 2010. ^ Huey, Steve. "Green River Biography". Allmusic. Retrieved November 13, 2010. ^ Ankeny, Jason. "10 Minute Warning Biography". Allmusic. Retrieved November 13, 2010. ^ Book, John. "Shine Review". Allmusic. Retrieved November 13, 2010. ^ Appelo, Tim (July 24, 1992). "Twin Tragedy". Entertainment Weekly. ^ "Andrew Patrick Wood". Find a Grave. ^ "MOTHER LOVE BONE - APPLE Mother Love Bone Influential pre-grunge landmark re-emerges after years in limbo". Uncut. Archived from the original on September 13, 2012. Retrieved November 13, 2010. ^ Browne, David (November 18, 1990). "RECORDINGS VIEW; Seattle Rock: Out of the Woods And Into the Wild". The New York Times. ^ Turman, Katherine (October 1991). "Life Rules". RIP. ^ a b Thomas Erlewine, Stephen. "Temple of the Dog Biography". Allmusic. Retrieved November 13, 2010. ^ a b Browne, David (May 3, 1991). "Temple of the Dog (1991)". Entertainment Weekly. Retrieved November 23, 2015. ^ "Jerry Cantrell wrote Alice in Chains' "Would?" as a tribute to Andrew Wood from Mother Love Bone". YouTube. July 8, 2017. Retrieved November 6, 2017. ^ a b Torreano, Bradley. "Whipped! Review". Allmusic. Retrieved November 13, 2010. ^ "Interview with War Babies Vocalist Brad Sinsel". FullInBloomMusic.com. April 18, 2008. ^ Rekindled :: Candlebox's Kevin Martin talks to AAM Archived 2010-11-20 at the Wayback Machine All Access Magazine (July 24, 2008). Retrieved on 12-10-10. ^ a b c Prato, Greg. "Return to Olympus Review". Allmusic. Retrieved November 13, 2010. ^ a b c Scanlon, Tom (September 16, 2005). "Pre- and post-grunge: Andrew Wood, folk scene". The Seattle Times. Retrieved November 13, 2010. ^ "Documentary to Remember Mother Love Bone's Wood". Spin. October 3, 2005. ^ "Malfunkshun". Malfunkshun. Archived from the original on 2015-03-12. Retrieved 2014-08-27. ^ "Chris Cornell - Island Of Summer (With Andrew Wood)". YouTube. 14 July 2011. Retrieved 31 May 2017. ^ "Unreleased Song From Chris Cornell & Andrew Wood "Island of Summer" Coming Soon". Alternative Nation. 27 June 2011. Archived from the original on 2017-12-31. Retrieved 31 May 2017. ^ "Cameron Crowe Says That Andrew Wood Was An Inspiration Behind Pearl Jam Twenty Film". Alternative Nation. 22 December 2011. Archived from the original on 2017-09-23. Retrieved 31 May 2017. ^ "Mother Love Bone: Top Music Videos". Billboard. Retrieved 2009-03-09. List of notable events in music that took place in the year 1966. Andrew is the English form of a given name common in many countries. In the 1990s, it was among the top ten most popular names given to boys in English-speaking countries. In Italian, the equivalent to "Andrew" is "Andrea", though "Andrea" is feminine in most other languages. "Andrew" is frequently shortened to "Andy" or "Drew". The word is derived from the Greek: Ἀνδρέας, Andreas, itself related to Ancient Greek: ἀνήρ/ἀνδρός aner/andros, "man" (as opposed to "woman"), thus meaning "manly" and, as consequence, "brave", "strong", "courageous", and "warrior". In the King James Bible, the Greek "Ἀνδρέας" is translated as Andrew.